The conference is free of charge. This includes the catering offered within the event. The conference is free of charge. This includes also the catering offered in scope of the event. 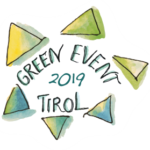 We aim at certifying this event as „Green Event Tirol“. This is only one of the reasons why your arrival by sustainable means of transportation and your support of the initiative on site is highly welcome. We ask all participants to opt for a climate-friendly journey. For a comparison of your travel options we recommend www.goeuro.co.uk. If you need to travel by plane or by car, we invite you to offset your trip`s emissions, e.g. via www.atmosfair.de. You can enquire hotel rooms via this link, which was arranged for the AlpWeek Intermezzo. Hotel rooms are in high demand at that time. We recommend booking your room as early as possible. The event will be documented photographically. With your participation you agree to a possible publication of pictures.